Hailwildcats.com invites you to our WILDCATS “PREY TOGETHER” Game Watch Party on October 21st, 2017 starting at 12:45 p.m. EST when our Mighty Wildcats of Bethune-Cookman University take on the Aggies of North Carolina A & T University on ESPN3. The game will air live on the “BIG SCREENS” of HOULIGAN’S at 1725 W. International Speedway Blvd Daytona Beach, FL 32114. Just as in the past, the bar will have drink specials and food for Wildcat Alumni and fans. Kick off is at 1 pm…be there early as Saturday is a very popular at Houligan’s. Hailwildcats.com invites you to our WILDCATS “PREY TOGETHER” Game Watch Party on October 22nd, 2016 starting at 1:30 p.m. EST when our Mighty Wildcats of Bethune-Cookman University take on the Spartans of Norfolk State University on ESPN3. The game will air live on the “BIG SCREENS” of Daytona Ale House at 2610 W. International Speedway Blvd Daytona Beach, FL 32114. Just as in the past, the bar will have drink specials and food for Wildcat Alumni and fans. The Ale House has secured the patio area for us all but don’t be late as seating is first come first serve. Kick off is at 2 pm…be there early as Saturday is a very popular at Ale House. If you’re not AT the game, we want to see you at the Daytona Ale House on 10/22. Please share this event in all of your circles. JOIN US FOR FOOD, FUN, and FOOTBALL! 2610 W. International Speedway Blvd. We look forward to seeing you there! The Party starts at 1:30 P.M. If you have spent any time in or around Daytona Beach since the beginning of this decade, you know there are three constants on which you can bank. 3 ~ Bethune-Cookman ending the season atop the MEAC standings. The Wildcats have won or shared the MEAC crown in all but one year this decade. They have averaged over 9 wins a season in that span, produced MEAC Player of the Year awardees on both sides of the ball, sent talent on to the professional ranks…….well you get the point. BCU football has been pretty dang good since 2010 and this year should be no exception. 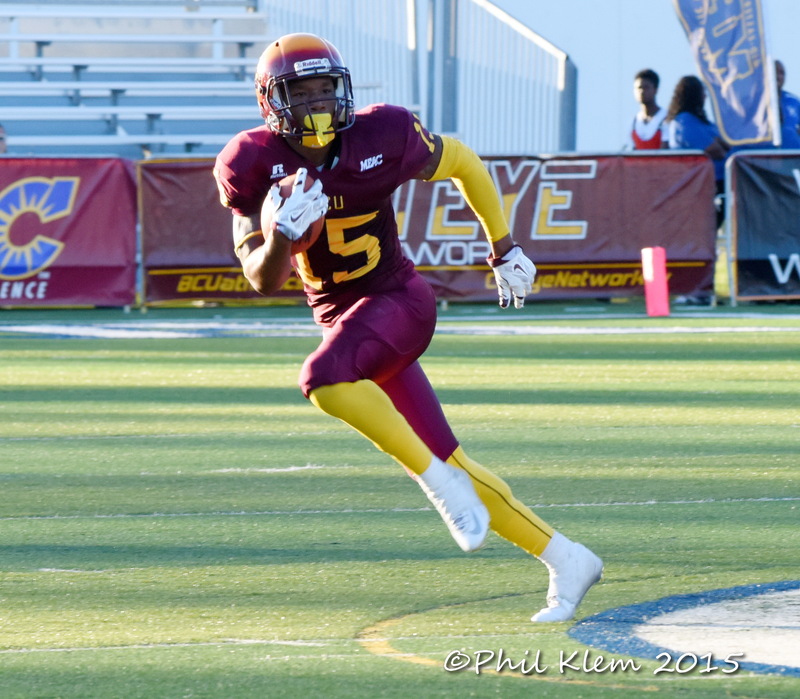 Terry Sims (9-2 in 2015) enters his second season with much of his 2015 MEAC Co-Championship team still intact. Sims’ squad returns 7 offensive starters, as many on defense, the punter, placekicker, return specialists, Elvis, Bigfoot, ‘eerybody’ is back for the party. Simply put, the talent is in place for BCU to make yet another run at the conference crown and perhaps earn their first ever trip to the Celebration Bowl in Atlanta. The Wildcats led the conference in several offensive categories a season ago including Scoring Offense (31.4 ppg) and Total Offense (445 ypg). Trevin Huff, Phillip Norman and Dazzie Morris return as starters along the offensive front. 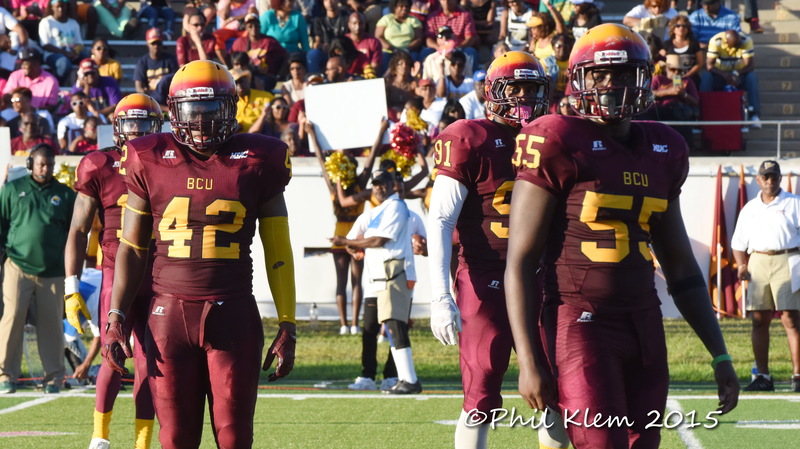 The trio will try to help set the stage for BCU’s high powered offense. Job Buissereth (6’4”, 325) and David Bryant (6’7”, 336) will look to anchor the right side of the line. Ja-Quan Lumas and Michael Boland are both expected to see regular action at the tight end position. Lumas finished the year with 3 receiving touchdowns and could see more red zone targets this year. Larry Brihm has had flashes of brilliance for BCU (think 2014 Florida Classic and 2015 comeback win against Grambling State). His experience in Jim Pry’s offense makes him the favorite to take over the reins at quarterback for the now departed Quentin Williams. Brihm will need to show more consistency in the pocket if he plans to remain the unquestioned primary signal caller throughout the course of the season. Redshirt freshman Arkevious Williams and JUCO transfer Anthony Cruz will look to challenge Brihm for snaps. Wide receiver is easily BCU’s deepest position. JaWill Davis , Frank Brown, Keavon Mitchell, Jontavious Carter, and Jaime Wilson have all had great moments in Maroon and Gold jerseys. Davis (39 rec, 6 TDs) is perhaps the best deep threat of the bunch while Brown (30 rec, 6 TDs), is the most reliable route runner and pass catcher of the crew. Travares Copeland is a North Carolina State transfer looking to add his name in the mix of this already talented bunch. Copeland can be dynamic with the ball in his hands and has the ability to contribute as a receiver, return specialist or ball carrier. Speaking of ball carriers, Michael Jones has evolved from former walk-on into a Preseason All-MEAC 1st Team running back. Jones is a multidimensional player who contributes in both the run and pass game. In fact, he led the Wildcats in All-Purpose yards (880) a season ago. Freshman Tupac Isme and Marcus Levy should also find regular minutes in the backfield. The Wildcats return all four starters as well as their first line rotational guys along the defensive front. Kevin Thompson and Todney Evans developed nicely as last season progressed and both look physically stronger this year. Thompson and Evans have exceptional athleticism and quickness at the defensive end position. Both have a chance to be stars in this league if they can meet the physicality demands of the position. DaMarcus Womack weighs in at 6’3”, 350 pounds. He along with the familiar faces of Jamal Thomas, DiShawn Ray and Anthony Meyer will look to plug the middle of the defense more consistently than we saw a year ago. Malik Slaughter was a highly touted JUCO player who is now looking to be an impact player at the FCS level. All-MEAC Preseason selectee Trenton Bridges’ responsibilities will extend far beyond bringing down opposing running backs when he line up at middle linebacker this year. Bridges will be counted upon to make the right defensive checks and for leading a linebacking crew that will feature first year starters flanking him on both sides. Atreyu Farrior, Werley Placide and Veion Robinson have first dibs at making their names as starters in Yogi Jones’ defense. Diquan Richardson is the leader of a secondary that is expected to be much improved in 2016. Arthur Williams provides BCU with some much needed length at corner while Sophomore Elliott Miller is a speedy cover guy who looks to build on a solid 2015 campaign. Former cornerback and UCF product Jeremy Davis switches to safety. Another year of seasoning should help this year’s Wildcat defense rebound from a season that saw them fall to the middle of the pack in most defensive categories. Coach Sims and his 4 time defending MEAC championship squad kick things off this Sunday at 1:00 against Alcorn State in the 12th Annual MEAC/SWAC Challenge. The game will be televised on ESPN and streamed on WatchESPN. Congratulations to Mrs. Emma Price of Daytona Beach on winning the Hailwildcats.com BCU vs Norfolk State “Watch Party” Raffle for (2) 2014 Florida Blue Florida Classic Tickets. If you missed the past raffle, you have another opportunity this week, details below! Congrats again Mrs. Emma Price! Hailwildcats.com will host a WILDCATS “LETS GO” Watch Party on Thursday November 13th, 2014 starting at 7 p.m. EST when our Mighty Wildcats of Bethune-Cookman University take on the Pirates of Hampton University on ESPNU. The game will air live on the “BIG SCREEN” of Buffalo Wild Wings at 2479 W. International Speedway Blvd Daytona Beach, FL 32114. JOIN US FOR FOOTBALL, FOOD, and FUN! 2479 W. International Speedway Blvd. We look forward to seeing you there! Kickoff at 7:30 P.M.
Hailwildcats.com will host a WILDCATS “LETS GO” Watch Party on Thursday November 6th, 2014 starting at 7 p.m. EST when our Mighty Wildcats of Bethune-Cookman University take on the Spartans of Norfolk State University on ESPNU. The game will air live on the “BIG SCREEN” of Buffalo Wild Wings at 2479 W. International Speedway Blvd Daytona Beach, FL 32114. Norfolk, VA – Fourth-year head coach Brian Jenkins of Bethune-Cookman was selected for his third Coach of the Year honor. Jenkins led the Wildcats to a 7-1 MEAC mark and a 10-2 overall record. The Wildcats defeated Florida A&M, 29-10, to clinch a share of the conference’s regular season title and secure the MEAC’s automatic berth to the NCAA Division I (FCS) Championships. The Wildcats are currently ranked 12th in both the Sports Network’s FCS and FCS Coaches Poll. He has led Bethune-Cookman to three MEAC titles in four years and fell just one game shy of back-to-back undefeated MEAC finishes. Howard quarterback Greg McGhee was selected as the Mid-Eastern Athletic Conference’s (MEAC) Offensive Player of the Year and Joe Thomas of South Carolina State earned the Defensive Player of the Year honors, as voted on by the MEAC’s head football coaches and sports information directors. North Carolina A&T’s Tarik Cohen earned the Rookie of the Year award and Tristan Bellamy, of S.C. State, was selected as Offensive Lineman of the Year. Junior Greg McGhee led the MEAC in total offense (272.9 avg./g) and ranked second in passing yards per game (198.2 avg./g). He completed 228 passes on 385 attempts (59%) with 16 touchdowns in 12 games this season. He also finished the season ranked third in the MEAC in rushing with 896 yards (74.7 avg./g), on 157 attempts, and three touchdowns. McGhee ranks 19th in the nation in total offense and 31st in completions per game (19). He earned conference Offensive Player of the Week accolades twice this season. McGhee is the tenth Bison to earn the conference’s Offensive Player of the Year honor and first since Ted White in 1996. Joe Thomas recorded 116 total tackles, 84 solo, with a conference-best 19 tackles for a loss during the 2013 campaign. Thomas collected 7.5 sacks, sixth in the MEAC, with one interception, five breakups, five hurries, one forced fumble and one fumble recovery to help the Bulldogs finish as the nation’s No. 1 rushing defense (80.5 avg./g) and No. 2 scoring defense (14.0 avg./g). Thomas earned Defensive Player of the Week honors once this season and is currently listed on the Sports Network’s Buck Buchannan Award watch list, which recognizes the nation’s top Football Championship Subdivision (FCS) defensive player. Thomas becomes the 13th Bulldog to earn the conference’s top defensive award, however he is only the second to have been selected in more than 10 years (David Erby 2010). As a freshman, North Carolina A&T’s Tarik Cohen led the MEAC in rushing, averaging 104.4 yards per game (,) on 195 attempts with eight touchdowns. He earned the conference’s Offensive Player of the Week accolades three times and Rookie of the Week honors twice this season. A native of Bunn, North Carolina, Cohen became the first freshman in North Carolina A&T State history to rush for over 1,000 yards in a season. Cohen’s is currently listed on the Sports Network’s Jerry Rice Award watch list, which recognizes the nation’s top FCS freshman. Cohen is just the second Aggie to be named Rookie of the Year. He joins the school’s all-time rushing leader, Mike Mayhew, who earned the honor in 2009. Tristan Bellamy aided a dominating Bulldog offense that accounted for 4,101 yards of total offense , including 2,000 yards on the ground. Behind Bellamy’s blocking S.C. State finished second in the MEAC in scoring offense (29.6 ppg), and third in total offense (341.1 avg./g). Bellamy earned the conference’s Offensive Lineman of the Week honor twice this season. Bellamy is the sixth Bulldog to earn Offensive Lineman of the Year accolades. South Carolina State led all schools with 13 student-athletes recognized on the three MEAC post-season teams. The Bulldogs have five student-athletes earn first-team honors, in addition to two-of-four top awards. Bethune-Cookman finished close behind with 12 student-athletes to earn post–season honors, in addition to five first-team selections. QB Greg McGhee Jr. Howard Pittsburgh, Pa.
RB Tarik Cohen Fr. North Carolina A&T Bunn, N.C.
RB Rolandan Finch Grad. Norfolk State New Albany, Ind. WR Tyler McDonald Sr. South Carolina State Summerville, S.C.
WR Milton Williams III Jr. Delaware State Upper Marlboro, Md. TE Joseph Hawkins r-Sr. Norfolk State Chicago, Ill.
C Andrew Edourad Jr. Bethune-Cookman Philadelphia, Pa.
OL Karim Barton Sr. Morgan State Los Angeles, Calif.
OL Alex Monroe Sr. Bethune-Cookman Jacksonville, Fla.
OL Domanic Wilson r-So. South Carolina State Lake City, S.C.
OL Rashard Brown Sr. Bethune-Cookman Kissimmee, Fla.
DL Miles Groom So. Hampton Richmond, Va.
DL Andrew Carter r-Jr. South Carolina State Hamlet, N.C.
DL Alex Glover Jr. South Carolina State Charlotte, N.C.
DL Rodney Gunter Jr. Delaware State Haines, Fla.
LB Lynden Trail r-Jr. Norfolk State Miami, Fla.
LB Jarkevis Fields Sr. Bethune-Cookman Samford, Fla.
LB Joe Thomas r-Sr. South Carolina State Blackville, S.C.
DB Nick Addison Jr. Bethune-Cookman Tampa, Fla.
DB Darrin Marrow r-Jr. Norfolk State Virginia Beach, Va.
DB Justin Blake r-Sr. Hampton Piscataway, N.J.
DB Ademola Olatunji Jr. Howard Riverdale, Md. P Lawrence Forbes r-Fr. Morgan State Upper Marlboro, Md. PK Anthony Prevost Fr. Hampton Chesterfield, Va.
RS Adrian Wilkins r-So. North Carolina Central Forest City, N.C.
QB Cory Murphy Sr. Delaware State Sunnyvale, Calif.
RB Isidore Jackson Sr. Bethune-Cookman Mossy Head, Fla.
RB Anthony Philyaw Fr. Howard Redondo Beach, Calif.
WR Eddie Poole Grad. 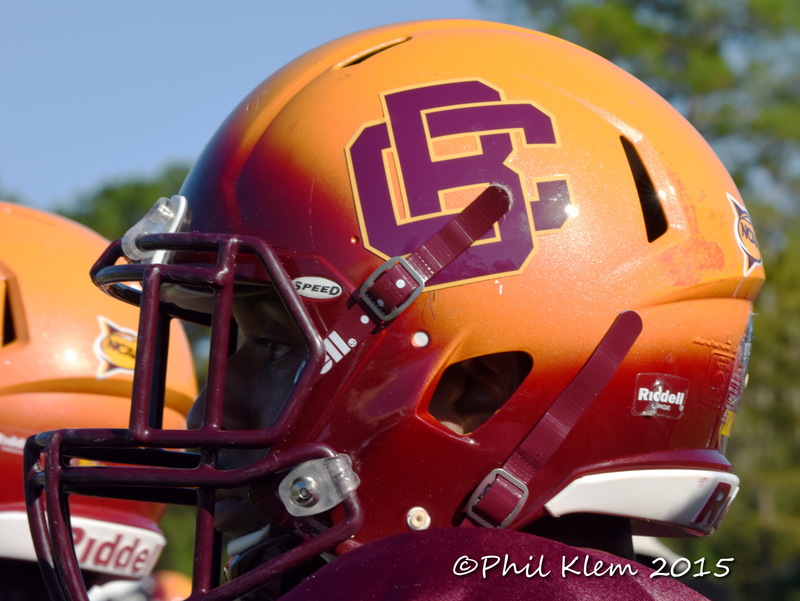 Bethune-Cookman Belle Glade, Fla.
WR Simon Heyward Sr. Savannah State Savannah, Ga.
TE Kris Drummond Jr. Savannah State Washington, D.C.
C Tristan Bellamy r-Sr. South Carolina State Johnston, S.C.
OL William Robinson r-Jr. North Carolina A&T Clinton, Md. OL Nathan Isles Sr. North Carolina A&T Atlanta, Ga.
OL Darren Pinnock Jr. Morgan State Miami, Fla.
OL Kory Alpichi Jr. Hampton Winchester, Calif.
DL Dyron Dye Grad. Bethune-Cookman Sanford, Fla.
DL Javon Hargrave So. South Carolina State Salisbury, N.C.
DL LeBrandon Richardson Jr. Bethune-Cookman Miami, Fla.
DL Deon King So. Norfolk State Reston, Va.
LB D’Vonte Grant Sr. North Carolina A&T Charlotte, N.C.
LB Delbert Tyler Sr. Hampton Monroeville, Pa.
LB Tazmon Foster Sr. North Carolina Central Henderson, N.C.
DB D’Vonte Graham Sr. North Carolina A&T Tallahassee, Fla.
DB Michael Jones Fr. North Carolina Central Baltimore, Md. DB Kimario McFadden Sr. South Carolina State Riverdale, Ga.
DB Carvin Johnson Sr. Hampton New Orleans, La. P Christian Faber-Kinney r-Fr. Hampton Williamsburg, Va.
PK Nick Belcher r-Sr. South Carolina State Sumter, S.C.
RS* Tubotein Taylor Sr. Morgan State Anaheim, Calif.
RS* D’Vonte Graham Sr. North Carolina A&T Tallahassee, Fla.
QB Richard Cue r-Sr. South Carolina State Florence, S.C.
RB Lamont Brown r-Fr. Morgan State Suffolk, Va.
RB Justin Taylor r-Sr. South Carolina State Atlanta, Ga.
WR Antwon Chisholm Sr. Hampton Belle Glade, Fla.
WR* Lenworth Lennon r-Jr. Florida A&M Ft. Lauderdale, Fla.
WR* Malik Golson r-Fr. Delaware State Smyrna, Del. TE Termarrick Hemingway r-So. South Carolina State Loris, S.C.
C Joshua Matthews Sr. Howard Bowman, S.C.
OL Toree Boyd Fr. Howard Miami, Fla.
OL Deonta Allen-Wright r-So. Howard Midolthian, Va.
OL Blake Matthews r-Sr. Norfolk State Manassas, Va.
OL Anthony Kibler Jr. Bethune-Cookman Belle Glade, Fla.
DL Tyree Hearn Sr. North Carolina A&T Durham, N.C.
DL Damon Gresham Chisholm So. Howard Covington, Ga.
DL George Riddick Jr. Norfolk State Suffolk, Va.
DL Tevin Toney Sr. Bethune-Cookman Sebring, Fla.
LB Marquis Smith So. Savannah State Prince Georges County, Md. LB Cody Acker Jr. Morgan State Greenbelt, Md. LB Ernest Adjei Sr. Delaware State Woodbridge, Ga.
DB Terrick Colston So. Delaware State Lakeland, Fla.
DB Travis Crosby Sr. North Carolina A&T Charlotte, N.C.
DB John Wilson Sr. Savannah State Athens, Ga.
DB* Tim Burke Sr. Bethune-Cookman Ft. Lauderdale, Fla.
DB* Patrick Aiken r-So. Florida A&M Miramar, Fla.
P Oleg Parent Jr. North Carolina Central Lake Forest, Calif.
PK Cody Jones Fr. North Carolina A&T Gastonia, N.C.
RS Darius Drummond Sr. South Carolina State Asheville, N.C. So we caught up with Randy from the CoastalFans.com blog/forum for a Q&A session on this weekend’s 1st round matchup between Bethune-Cookman and Coastal Carolina. A big thank you to Chanticleer super-fan Randy for his time and effort. Q1) After securing the first playoff win in school history a season ago, how have expectations changed this season for Coastal Carolina? Would Chanticleer fans consider this year a disappointment if CCU did not win a playoff game? A: Expectations were hopeful after last season, with many fans predicting CCU would finish somewhere in the neighborhood of 9-3 heading into the postseason. I don’t think it would be fair to the hard work & effort our players have put in this year to brand their entire season – a 10-2 effort which has set a ton of all-time program records – as a “disappointment” just because of one loss. Q2) Head Coach Joe Moglia has hit the ground rolling in Conway leading CCU to back to back Big South titles and playoff appearances in his first two seasons. What has made Coach Moglia so successful so quickly? Is he not long for the office in Conway or do you expect him to stick around with the hopes of building CCU into a FCS powerhouse? A: Coach Moglia has consistently said that it would take a “dream job”-type scenario to pull him away from Conway. Specifically, he says it would have to be a job where both CCU’s AD & President tell him that he has to take it. Moglia’s not going anywhere for the likes of Toledo, Buffalo or UConn. He will be here for the foreseeable future unless that “dream job” comes along. Personally, I’m more worried about us retaining OC Dave Patenaude if our offense continues to put up the numbers it has been putting up since he came on board. Q3) Any concerns about the mood/health of the team after losing to SEC power South Carolina 70-10 in your last outing and 2 of the last 3 games overall? A: There is absolutely no concern about the team’s health after playing South Carolina. We came out of that game with no new injuries to any of our players. As far as the “mood” of the team, I don’t think losing a game to a top-10 FBS team is really cause for much concern. Besides – if I recall correctly, Bethune-Cookman got blown out by ACC powerhouse Florida State by a score of 54-6 & went on to win their next five games by an average margin of 19.4 points. The loss to CSU, a five point loss on the road against a top-20 FCS school, did indeed sting. But I think it refocused our players on their ultimate goal, which is to still be playing football in January. Q4) Running back Lorenzo Taliaferro is a Walter Payton Award Finalist, linebacker Quinn Backus is a Buck Buchanan Finalist, Matt Hazel has had a stellar career there, but who are some of the lesser known guys who have made significant contributions this season? A: Other players to look out for include RB DeAngelo “Hop” Henderson, WR DeMario Bennett and KR Devin Brown. Hop has consistently shown himself to be our future starter at RB, rushing for 536 yds on the season. Bennet, a Senior transfer from South Carolina, has been our #2 receiver all year and is just as dangerous as Hazel. Brown, a RS Freshman, has been explosive on special teams for us this year. Brown set a program record with a 95 yd kickoff return for a touchdown against VMI. Q5) Prediction on Saturday’s 1st round contest? 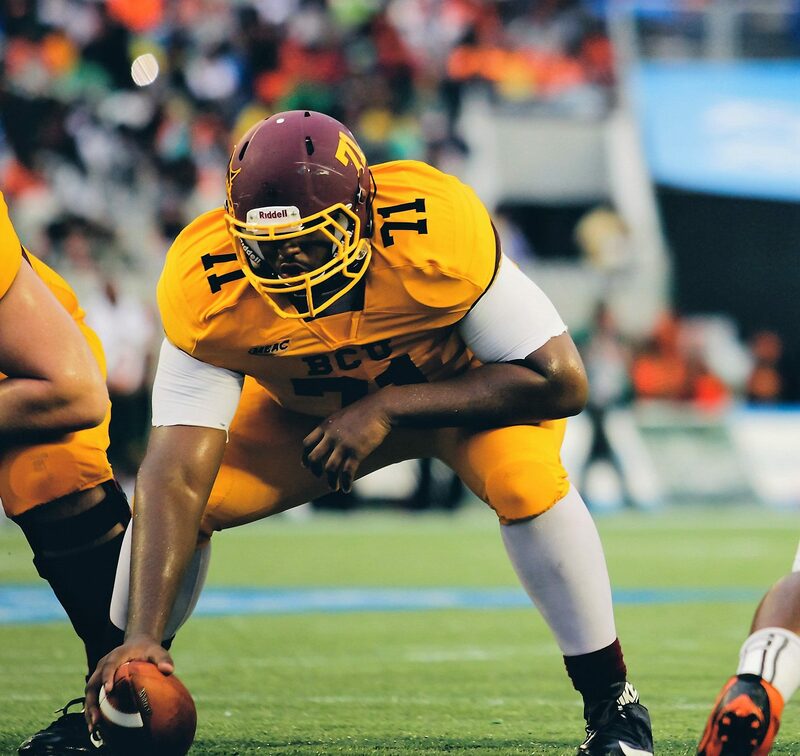 A: Bethune-Cookman is certainly no pushover, with one of the top defenses in the FCS. However, CCU has already squared off against several of the top-10 defenses at our level & done very well. We are winning games by an average of 22.6 PPG, and while BCU is only giving up an average of 12 PPG against FCS competition – I don’t think they’ve faced an offense quite like ours this season. The Wildcats also consistently hurt themselves with penalties, having been flagged a total of 115 times for 944 penalty yards on the season. While the “energetic” coaching style of Brian Jenkins may indeed inspire his players, it unfortunately causes his team to make too many mistakes on which I think the Chanticleers will capitalize. I do expect this to be a hard-fought game, and I do expect BCU to come out with a chip on their shoulder as they seem to feel they need to avenge their loss to the Chanticleers in last year’s FCS playoffs. The Wildcats obviously have a stellar defense, and it will be interesting to see how they contain RB Lorenzo Taliaferro (who has only lost 11 yards all season) and how they respond to our threats at WR. All that said – I think the Chants take this contest at home, 31-20. When the 2013 NCAA Football Championship Subdivision playoff pairings were announced last Sunday on ESPNU, of the 24 teams selected, three of them (Bethune-Cookman, South Carolina State, Tennessee State) were from Historically Black Colleges and Universities. It was the first time three HBCU’s had been selected for the postseason since 1999 (FAMU, Hampton, Tenn. State). Bethune-Cookman won the Mid-Eastern Athletic Conference’s automatic berth, while South Carolina State (MEAC) and Tennessee State (Ohio Valley) were selected as at-large participants. During the regular season, those teams forge some of the most intense rivalries in FCS football but once the playoffs begin, it’s not uncommon to hear coaches from opposing teams rooting for their HBCU brethren to do well in the tournament. For head coach Brian Jenkins of Bethune-Cookman, he was extremely excited to see all three schools make the field of 24.